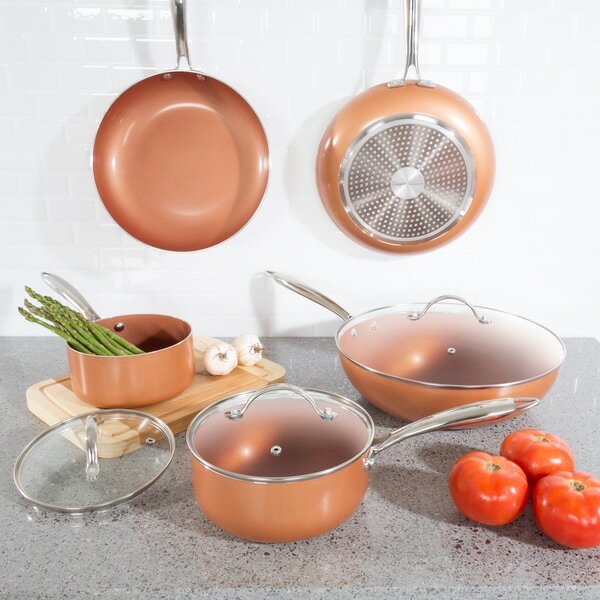 Allumi-shield Cookware by Classic Cuisine is durable, anti-warping, aluminum cookware with 2 Layers of Non-Stick Ceramic Coating for healthier cooking and easy clean up. Each of our pans has an a specially designed extra thick magnetic bottom for even heat distribution and induction cooktop compatibility.. Our lids are made of tempered glass and have double riveted stainless steel handles. Oven Proof, Dishwasher Safe, Non-Stick, Compatible with Gas, Electric, Glass and Induction Cook tops, this is a premium pan that will last for years. IMPORTANT:. Avoid buying counterfeit products and transacting with unauthorized sellers.. Look for our logo on the packaging for every one of our products.. Classic Cuisine is committed to providing the consumer with the absolute best price and value on our entire line of products, which we ensure by applying a rigorous Quality Control process. LIGHT WEIGHT AND DURABLE - The pan base is made of Anti-Warping Aluminum making it both light weight and durable.. Our lids are made of thick tempered glass and have a vent hole. We have attached a high quality stainless steel handle to all our pans and lids, double riveted for safety and durability. EASY TO USE AND CLEAN - The inside surface of each pan in this 8 piece set has 2 layers of Non-Stick Ceramic Finish. This non-stick technology allows you to cook using less oil and makes cleaning sticky and burnt on food a breeze.. Our tempered glass lids allow you to view your food without interrupting the cooking process. COMPATIBLE FOR ALL COOKING SURFACES -. This Alumi-shield cookware by Classic Cuisine is made with extra thick magnetic bottom for even heat distribution and induction cooktop compatibility.. You can use your cookware on gas, electric, glass and induction cook tops.. It is also oven safe. PRODUCT DETAILS - Pan are made of high quality pressed Aluminum, the lids are tempered glass, both have Stainless Steel, double riveted handles.. Each pan has 2 layers of Non-Stick Ceramic Coating.. Dishwasher Safe but hand wash with non-abrasive cleaner is best and sufficient. Silicone Utensils work best.. Avoid using metal utensils that can scratch the non-stick surface.. Oven proof up to 500 degrees Fahrenheit. SATISFACTION GUARANTEED - Classic Cuisine is committed to providing consumers with the absolute best price and value on our entire line of products. NOTE: This is an exclusive product of Classic Cuisine and ONLY 8-piece Set Allumi-shield Cookware Set by Classic Cuisine is GUARANTEED to be genuine. Decent cookware that looks nice. I wish some bigger pots with lids and a smaller pan were included in the set but this was nicely priced. After using the pans they aren’t necessarily nonstick while cooking but they clean out nicely. These pots and pans are lovely. I hung up the two saute pans because they look so nice. I bought them for a rental so I chose the 2 layer nonstick coating. If I notice any scratching, i will update my review. The only complaint I have is that there are not lids for the saute pans, only 3 lids for the 3 pots, and they don't fit the saute pans. Classic Cuisine 8 Pc. Cookware set is heavy, of high quality and the best I have seen. The price is so realistic, too. Others I have seen cost twice as much and are not as heavily made. The 2 layer nonstick coating is a plus also. I love it! I purchased this set because I love the color, ceramic coating, and yes, they are compatible on any cook surface including induction. I live in the mountains and it takes forever to boil water so I use an induction cooker. If you have never tried one, you don't know what you are missing. This set is so nice and reasonably priced. I have been a O club member since 2012 and was able to apply some of my rewards to make the already low price even better. What a good deal! I love shopping on Overstock because they always ship right away. The service is dependable. It was a great value and awesome product. I cant believe product like this priced so reasonably. Just be careful since this is ceramic dont cook anything high.. I cook all my food low heat so it tastes better this is perfect for me.. Highly recommend to anyone. Overstock always has amazing products with great value. This set arrived quickly and is a great variety of sizes with lids for 4 of 5 pieces. That's hard to find! They have been balanced on my ceramic stove top but I haven't put them in the oven yet. The non stick is great and they are super easy to clean with soap and water. If your looking for a starter set or to replace (or downsize in my case) this is great one to go with. This cookware set is beautiful and well-functioning. I have been using it for a month now and very, very satisfied with the quality. I love the color I love how easily they clean in the dishwasher. Highly recommend! These pans are very nicely made. Thick, clad ceramic allows for easy clean-up. They would also make a great gift. Also, they will work in the dishwasher! Great set for everyday cooking. Easy cleanup and never burns your food! The only thing that would have made this better would be if there were lids for all of the pans. Still a perfect set!!! I was worried about buying these because they were so inexpensive- thinking you get what you pay for. But went for it and was pleasantly surprised they are very nice! Much better quality than I expected. Just started using them, no complaints at all. Love this set. I wish it had more pots, rather than the skillets, but it works great. Cleans up easily. Would buy more if they had larger pots. You cannot beat this price for the quality of the cookware! I love to cook and this far outweighs any other cookware I have ever owned. It heats perfectly and NONSTICK is an understatement! Food just flies out of the pan! LOVE IT! Needed to replace my old pots because we got an induction cook top. I love the non stick surface. They have held up very well, even after putting them in the dishwasher. I love that the cookwear doesn't stick and clean up is a snap. They look great, they are not heavy in your hands but, cooking with them , they are the best I've wen or used in,a long while. I will venture to say , they are professional grade. Will only cook with this cook wear from now on. Thank you Overstock! This product is absolutely amazing. I love the pans they work fabulously. One of the best sets I've ever owned. Like the reviews. Just the right combination and sizes needed. Like the deep pan. They are oven proof. How to Break in a Stainless Steel Frying Pan from Overstock.com. Unlike cast-iron fry pans, stainless steel fry pans don't need to be seasoned before use, but each time you use them, you'll want to follow these steps.